School board members have identified $1.523 million in budget adjustments they’ll be considering for the coming year. The list includes a reduction in the areas of professional development and curriculum development, cuts to administrative positions, a change in the high school staffing ratio, and increased fees for high school athletics and activities and facility rentals. View the list. Board members expect to vote on the budget adjustment list on Dec. 20. Keep up on the latest school board news. Check out the Dec. 13 School Board Meeting Notes online. The Stillwater Area High School Winter Concert is sold out but you can still watch it live. The band, orchestra and choir will perform tonight Sunday, December 16 at 7 p.m. Valley Access Channels will stream the concert live. You can watch it on their YouTube Channel, Facebook page, VACTV.org, or cable channel 15. A major achievement for senior guard Sara Scalia as she scored her 2,000 career point! The Minnesota Gopher commit added 22 points to her totals in the girls' 80-64 victory over Woodbury. Scalia is the all-time leader scorer in Ponies basketball history (girls and boys). Rutherford students meet the real, live Grinch! Sigmund’s son, Sawyer, and the entire third grade class from Rutherford went to see the show this week. 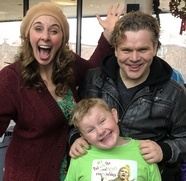 They also took part in a mini theater workshop led by Sawyer’s dad and mom, Autumn Ness, who plays the mother of Cindy Lou Who. After, the students visited the Minneapolis Institute of Arts. Some physics fun for students at Andersen Elementary! The UW River Falls Society of Physics Students (SPS) visited the school and demonstrated a number of hands-on science activities. 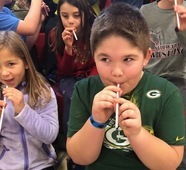 Principal Anna Wilcek took a ride on a hovercraft, students played “oboe straws” and physical education teacher Jordan Petersen even lay down on a bed of nails much to the delight of students. Watch the video. 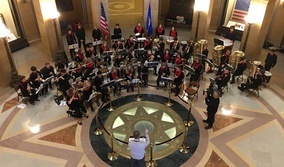 The Stillwater Middle School band performed holiday songs at the Capitol Rotunda. The eighth grade musicians also met with State Senator Karin Housley, who gave them a tour of the Senate Chambers. More photos on Facebook. 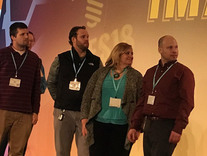 Tech staff named "Technology Team of the Year"
Our district's technology staff was named the TIES 2018 Technology Team of the Year for their outstanding work and leadership. TIES, now known as Sourcewell, provides educational technology services to school districts across the state. Tech team members include Julie Balfanz, Chris Fahey, Matt Howe, John Perry and Michael Teachout. The tech team works to help teachers use technology in innovative ways in the classroom to make learning fun and meaningful for students. 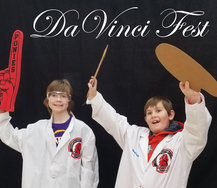 Celebrate arts, sciences and upcycling Saturday, January 5, at Da Vinci Fest at Stillwater Area High School. Whether it’s coding for girls, solar powered robots, podcasting, ballet, pottery or weaving, there’s something for everyone at this free community event! Da Vinci Fest is open to the public from 1 to 5 p.m. The exhibitors fair includes performances by Belle Ballet, Dia Sorin and 3M Wizards. In addition, there will be demonstrations by an ice sculptor, potter, printmaker, robotics club, and computer coding club. Listen to music, HUSH podcasting, poetry and drama performances. The Stillwater Science Challenge starts at 1pm. There will be a return visit by a Twin Cities club that creates life-sized working Star Wars droids. See a complete list of exhibitors online.